Does Fintech Pose a Threat to Cybersecurity at Financial Services Companies? Amazon Alexa in the Workplace: What Could You Do With a Virtual Assistant? Are Comatose Servers Draining Your Wallet and Leaving You Vulnerable? Data Sanitization: Are You Erasing Your Old PCs COMPLETELY? Internet Explorer: Upgrade Your Relationship or Break Up? Fake Phishing: The Ultimate Security Training? Lessons of Ashley Madison: How “Crackable” Are Your Passwords? DaaS and the Virtual Workspace: The Next Big Thing? Time To Think About Your Company's Next Tech Refresh? The Cloud: An Eco-Friendly Alternative? Is Tape Storage (Completely) Dead? The $100,000 Phone Bill: Is Your Office VoIP Phone System the Next Target? Welcome to the IoT: Will Your TV Be Watching YOU? Is Your Law Firm HIPAA Compliant? Should It Be? Are You Sure? The Cloud: A Better IT Choice for Law Firms… or Not? Disaster Recovery: Is Your Data Protected From the Next Catastrophe? 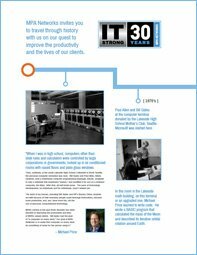 Use IT to Increase Workplace Productivity - Get the Whitepaper! Happy 31st Birthday, MPA Networks! Want Information Technology with Strong ROI? Take this Critical First Step. Resolve to Maximize IT Productivity in 2014!